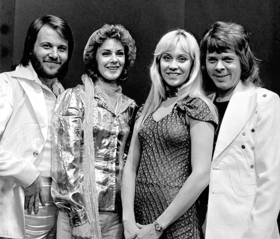 ABBA, 1972-yilda Agnetha Fältskog, Björn Ulvaeus, Benny Andersson va Anni-Frid Lyngstad tomonidan asos solingan Shved pop guruhi. Asosan bu guruh pop va pop-rok janrida kuylashadi. Guruh'ning faoliyat yillari 1974-yildan to 1982-yilgacha hisoblanadi. Shuningdek, bu guruh tomonidan yaratilgan Mamma Mia! musiqiy albomi mashhur bo‘lib, bu kuy bo‘yicha 2008-yilda ishlangan va Universal Pictures tomonidan tarqatilgan shu nomli film ham bor. ↑ Moskowitz, David V. (31 October 2015). The 100 Greatest Bands of All Time: A Guide to the Legends Who Rocked the World. GREENWOOD Publishing Group Incorporated, 1. ISBN 978-1440803390.